...the Wall Street Journal this morning notes that median Manhattan apartment prices have dropped to $1.08 million in 4Q 2017, down 9.8% compared to the peak set earlier this year. Not surprisingly, Pamela Liebman, the president of New York real estate broker The Corcoran Group, attributed the pause by Manhattan buyers to the tax bill and said that folks are increasingly convinced that prices peaked in 2017 and may continue to be under pressure. Of course, the New York real estate market wasn't universally rosy during the first half of the year as another broker, Donna Olshan, who produces a weekly report on contract signings above $4 million, said there were worrying signs in the luxury market, including an increase in the average time a listing spent on the market of nearly four months, from about 10 months in 2016 to 14 months this year. As the following chart from Douglas Elliman highlights, luxury prices in Manhattan peaked 2 quarters before overall prices and have been plummeting ever since. Meanwhile, new development prices have also been on the decline as the market contends with a steady stream of new buildings coming online. 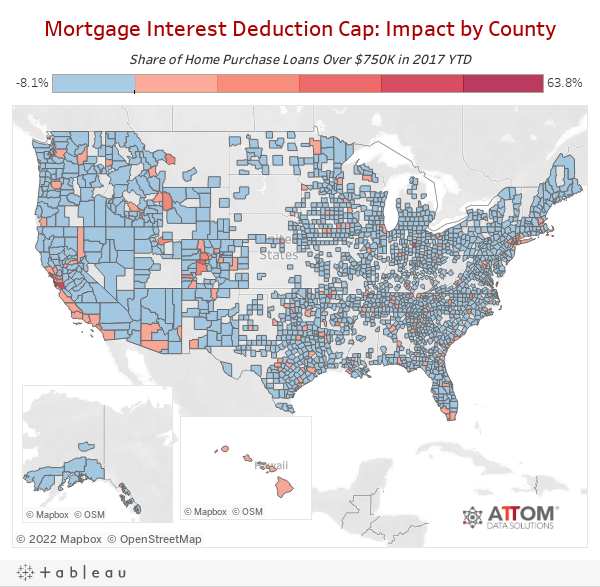 Of course, the fact that Manhattan real estate prices are coming under pressure should come as little surprise as we noted the following interactive maps from ATTOM Data Solutions last week which perfectly illustrated just how concentrated mortgages over $750,000 are in a handful of expensive cities like New York and San Francisco. 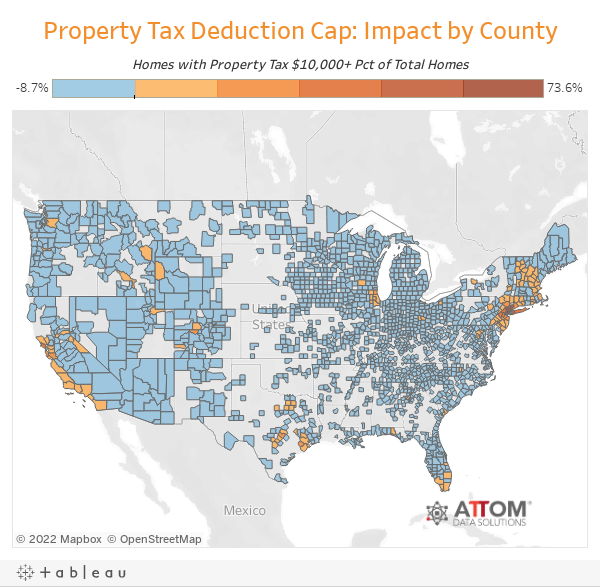 Meanwhile, the second proposed change in the GOP tax plan involved a cap on the deductibility of property taxes at $10,000. And, much like the impact of mortgage interest above, the map of who's most impacted looks eerily similar to the 2016 electoral college map. Conclusion: Low-tax, cheap cost of living states (i.e. "Red States") are suddenly starting to look a lot more attractive to liberal "millionaire, billionaire, private jet owners" in New York who aren't so keen on "spreading their wealth around" as their rhetoric would have you believe.